The Minister of Youth and Sports Barrister Solomon Dalung has expressed happiness in the conduct of the inaugural Annual General Assembly of the Nigeria Basketball Federation (NBBF) held over the weekend at Hotel De Bentley in Abuja and promised to support Engr Musa Kida fraction led board. “I must commend the Kida board for the pace at which you responded to the Minister’s call for Federations to deposit a copy of their constitution with the Ministry. The democratisation process would not be complete without a governance instrument the constitution. The call for this Annual General Meeting is not only a pointer to the readiness of this Board and indeed all stakeholders to grow and develop the game of Basketball in Nigeria, but more importantly, to provide an instrument of authority upon which the governance of the Federation will rest. The Minister praised the NBBF under the leadership of Engr Musa Kida for its numerous achievements since it was sworn-in in 2017. “The success and achievements of the NBBF under this Board testifies to this fact. Apart from the upward movement in ranking of our national teams – the D’Tigers becoming No 1 in Africa and 32 in the World Ranking and the Women’s Team, D’Tigress being No 2 in Africa and 19 in the World Ranking – the overall success of both teams have improved Nigeria’s image in the world and earned us much respect within the global Basketball family. Similarly, the Board has been able to stabilise affairs of the Federation, where rancour and mumblings have become a thing of the past. Barrister Dalung promised Government’s commitment to activating sports as a business in Nigeria and called on all aggrieved stakeholders to join hands to develop the game in the country. Earlier, the NBBF President, Musa Kida in his welcome address, extended his hand of fellowship to all stakeholders. “The present NBBF Board is willing to work with each and every basketball stakeholder in Nigeria devoid of any sentiments. We will continue to do all it takes to carry everyone along. He emphasized that one of cardinal goals and objectives of the NBBF under his watch is to take basketball to the grassroots so that youths and other stakeholders who have been neglected will have the opportunity of competing right in their backyards and propel them to greater challenges. 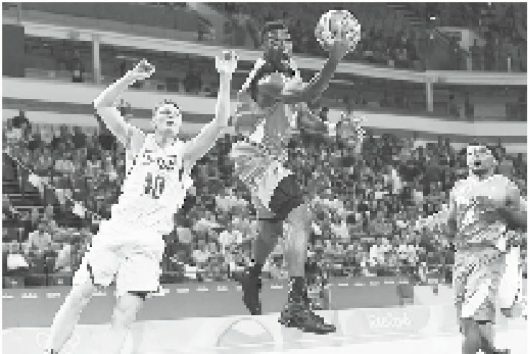 Meanwhile, the Federation of International Basketball Associations who were on ground to monitor the AGM confirmed that the body has identified Nigeria as one of the powerhouses in African basketball. Speaking through its representative, member of the FIBA Africa Central and President African Zone 5, Hesham El Hariri said the apex body will continue to back all responsive federations to grow the game.